This post clearly belong to general discussion, Please refrain from posting this kind of thing in the future. also the description is correct, you need to 30 times use the draw 10. so it\'s cannot be 300 times use draw 1. 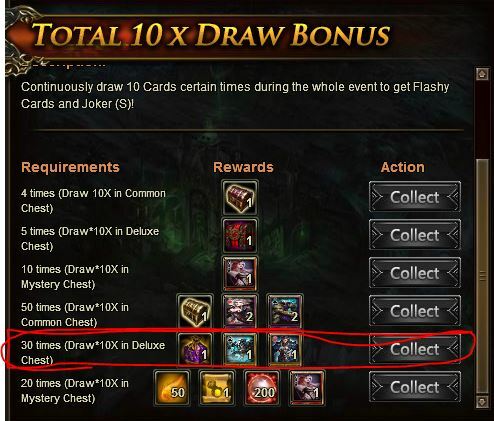 Sorry about that but nobody is taking into account that 3 X 10=30?AND THAT is the point!I can post SS of rest of HoC 10X draws I done and collected from rewards,BUt when doing the 30 draws using 10x NO COLLECT that\'s why it needs to read 300 instead of 30.Starting to think Dev\'s don\'t know how event works. 2019-4-22 00:46 GMT+8 , Processed in 0.080524 second(s), 42 queries .